Prepared by Ian Smith, 13th October 2013. 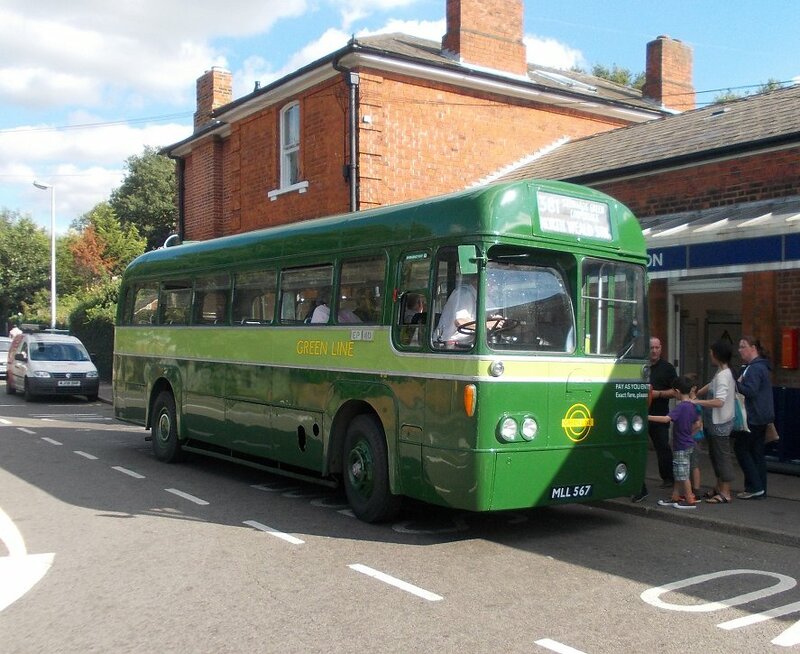 On the forecourt of North Weald Station RF180, newly restored to public passenger carrying service in historic Green Line livery, was waiting on the forecourt with a 381 to Epping Station. I went over to join Roger Wright, who was driving. The 381 was historically a complex route, with several variants at the eastern end (at the same time). Some terminated at Coopersale Common. 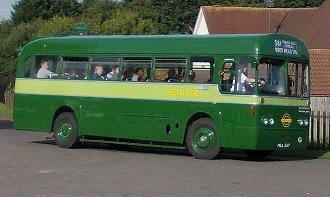 Others went to Toot Hill. Several routes were taken, to match the perceived traffic requirements. 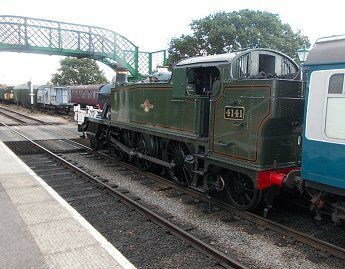 Briefly it ran to Ongar. 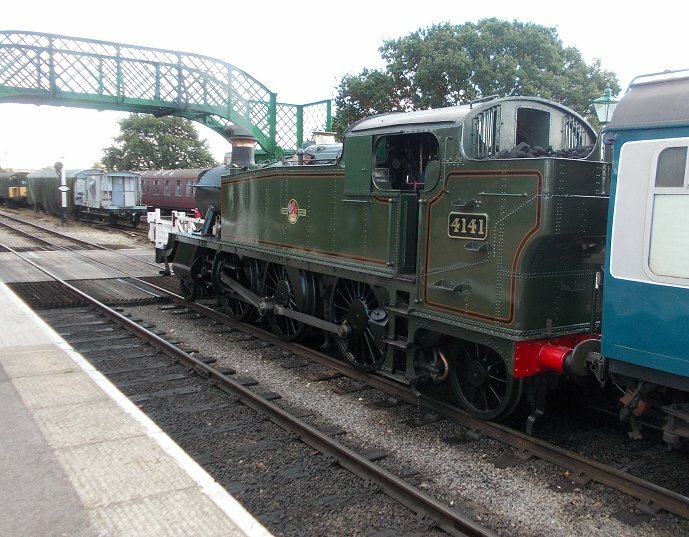 Roger Wright's new 381 has a similarly complexity, as well as the extensions to North Weald Station. 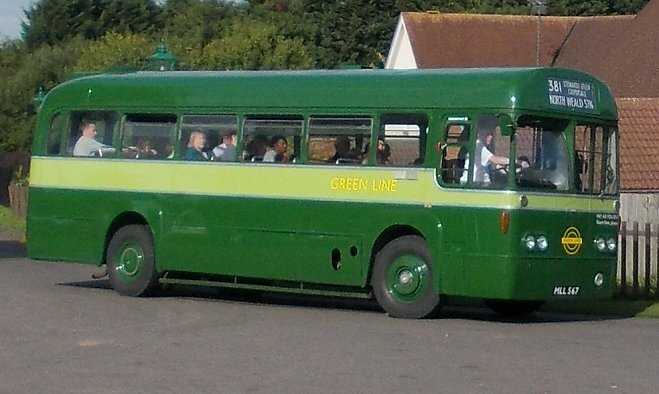 It runs variously via Toot Hill or Coopersale Common, to suit the requirements of the railway: when demand is likely to be light it takes the longer route via Toot Hill. When many passengers are presumed to need to be taken from Epping to North Weald to catch trains it operates more directly, via Coopersale Common. We set off. From the Station Approach we turned east through North Weald, along the road towards Ongar. 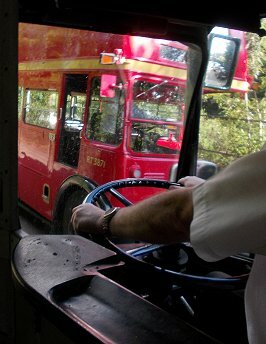 A right turn at The Talbot saw us on the busy A414 road, but we fairly soon swung off into Blake Hall Road, dipping down into the valley then climbing up past Blake Hall Station (closed). Blake Hall Road is reasonably wide, but Toot Hill Road, joined at Ivy Cottage, is a different matter. For car drivers it no doubt provides a handy rat-run, if one assumes no traffic coming the other way round the blind corners. And if that traffic is a bus... We had several close calls on the bends, as drivers of big cars arrived at speed. Apparently the problem is worse with RP21: the extra nine inches of width makes a world of difference. We burbled along through the scattered community, presently reaching the heart of Toot Hill at The Green Man. 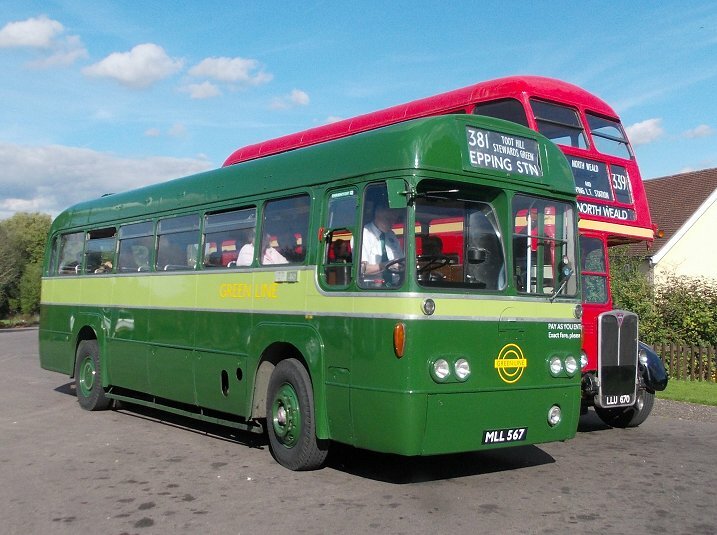 I had been here before, with the London Transport Museum's BN61 in September 2007. 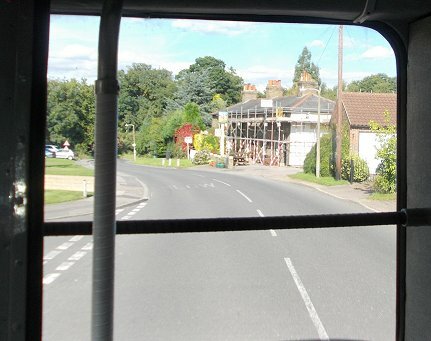 We continued along Epping Road, out of the village and on across rolling countryside. 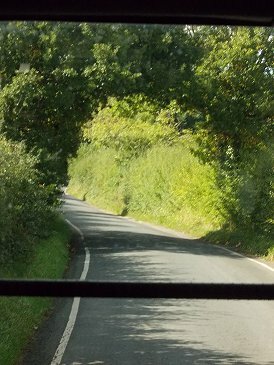 The road was wide enough to encourage speed, not wide enough for easy passing, especially on the bends. We descended Banks Lane, and turned right onto Mount Road, to pass under the M11 motorway and pass The Merry Fiddlers in Stewards Green. We continued along the valley bottom, being careful with a group of cyclists that wanted to ride three abreast, and turned up Bower Hill. A family alighted at the unmarked bus stop. We climbed the hill, and crossed the bridge over the Central Line, and turned down to Epping Station. 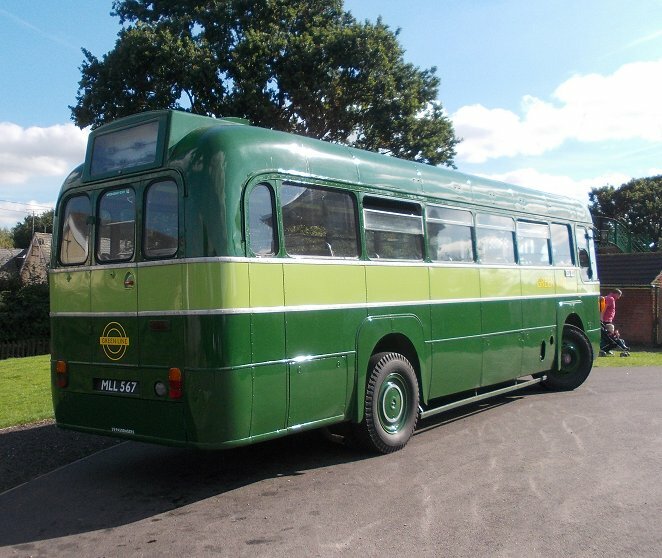 With people still arriving to visit the railway, the return trip was the fast route, via Coopersale Common. 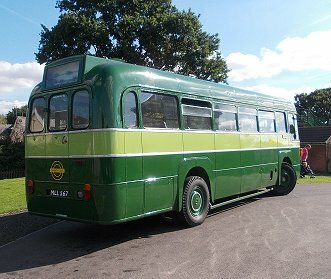 Prospective passengers were advised that a double-decker would arrive immediately after we left, to give them the choice. Some still chose the comfort of Green Line, or the different ambiance of an RF, or the bird in hand, so to speak. We turned outside the station. 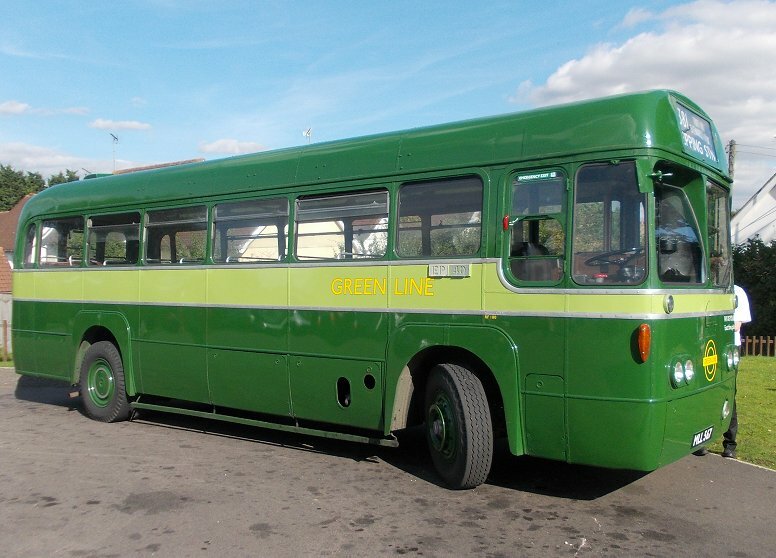 The turning circle is tight for the old buses, but just doable if unobstructed. We met RT3871 coming in as we climbed the Approach. We turned right, over the railway, and descended Bower Hill into the valley, and headed east. We turned uphill at Stewards Green, climbing up to Coopersale Street. The Theydon Oak pub was not as packed out as on my last 381 trip here, in May 2013. Up at Coopersale Common The Garnon Bushes - the terminal point for the old 381A - was covered in scaffolding. Roger's route goes on, under the railway: no RTs on this route! Just beyond the bridge, in Epping Forest, we met the 339 route from Epping, and turned right, to pass under the motorway and into North Weald. We turned up the station approach and parked on the forecourt. Roger just had time to have a cup of tea before his next return trip to Epping, so we retired to the Anglian Buffet, while in the station 205205 arrived on its way from Coopersale to Ongar, and the Prairie tank had arrived with its train.